Do This for Only Nine Minutes a Day and Completely Change Your Life! Living life as busily as we do, we tend to lose focus. This may just be losing our keys or forgetting an appointment, or it may be something more serious, like losing ourselves to addiction. 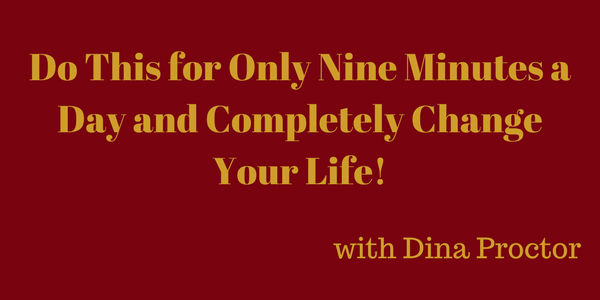 My guest today is life and business coach Dina Proctor. She is the best-selling author of Madly Chasing Peace: How I Went From Hell to Happy in Nine Minutes a Day. She’ll share with you her miraculous journey from hitting her emotional rock-bottom in the midst of addiction, discovering a process called “3X3 Meditation” and what led her to helping thousands of others around the world improve their lives. Meditation shouldn’t feel like a chore. Join us to find out how to make YOUR nine minutes the highlight of your day and learn more about this process at www.madlychasingpeace.com.